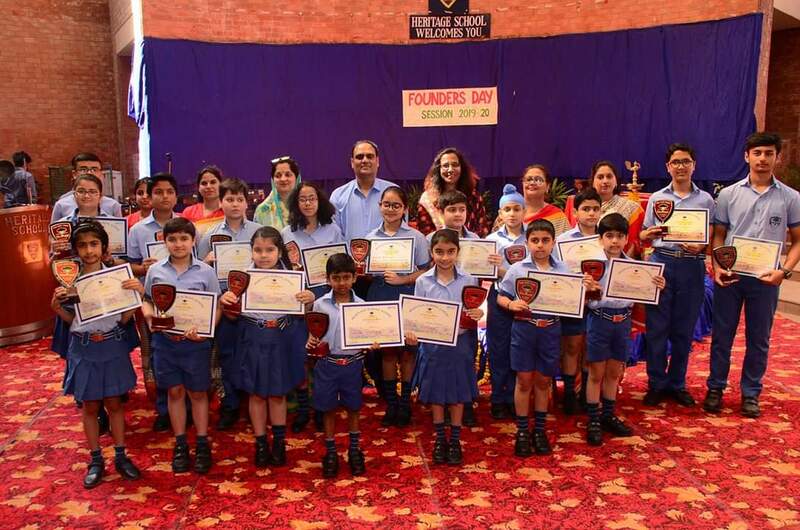 In keeping with its tradition Heritage School celebrated its 15th Founder’s Day event to commemorate its legacy and success as well as celebrate its achievements. It was a proud moment for the Management, Principal, staff and students who rejoiced to see the school coming such a long way since its inception in the year 2005. The Founder’s Day celebrations commenced with the invocation of the divine blessings. The school choir enthralled every one with a mellifluous song. A brief history of school’s march to success was also read out in which the achievements of the school were highlighted. The gala occasion also witnessed the students being awarded with an all rounder’s trophy for their scholastic and co-scholastic endeavours for the session 2018-19. Proud parents of these achievers were the special invitees of the day. The shining stars of the day were : Adamya Randhawa and Viaan Jain (I), Puneesh Puri and Arav (II), Jhanavi Raina and Suhana Dubey ( III), Archit Pandoh and Aarush Gupta (IV), Arihant Singh and Sehaj Satish Sharma (V), Atharav Dabgotra and Samaika Jarangal (VI), Amay Sharma and Seerat Arora (VII), Arush Gupta and Diya Gupta (VIII), Priyam Jamwal and Arnuv Raina (IX). In his address, the Principal Heritage School, Mr. Akash Pradhan applauded the efforts and commitment of the school faculty as well as their contribution. He exhorted everyone to uphold the values of the school and urge the students to be pioneers and elaborated upon the need for the students to be equipped enough to meet the global changes and therefore carve a niche for themselves. He also extended his gratitude to the parents for their unstinted support and contribution in helping the school realize its goal and mission. The Vote of Thanks was presented by the senior school co-ordinator Ms. Archana Sharma. The programme concluded with an immaculate musical rendition by the school orchestra.